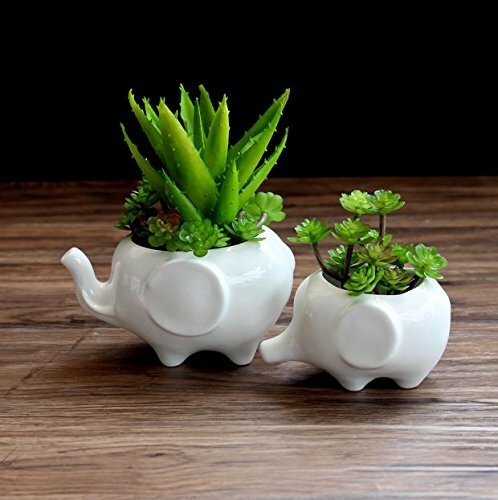 Sea star Set of 2 Cute Elephant Flower Pot,Modern White Ceramic Succulent Planter Pots / Tiny Flower Plant Containers (Elephant) by SeaStar at Halo Grow Box. MPN: 4336470556. Hurry! Limited time offer. Offer valid only while supplies last. Two set of modern, minimalist design white ceramic plant pots . Each planter comes with a draining hole that allows water to flow through the soil . Two set of modern, minimalist design white ceramic plant pots . Each planter comes with a draining hole that allows water to flow through the soil . Ideal for displaying live plants, but can also be used to hold and organize a variety of other items. Plants not included.Approximate Dimensions size:the big one 2.75x2.25x3inch.The small one,2.5x1.75x2.5inch. Each planter comes with a draining hole that allows water to flow through the soil. If you have any questions about this product by SeaStar, contact us by completing and submitting the form below. If you are looking for a specif part number, please include it with your message.